Frame is made of 16 gauge steel and surrounded by 22 gauge expansion casing bead with metal lath. Door is 14 gauge steel. Hinge is a concealed continuous piano hinge. 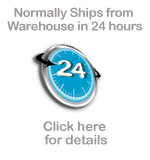 ** Doors larger than or equal to 36" are subject to oversize or LTL shipping charges.